On Monday, I posted about hanging pictures from a brass chain to get extra impact from your artwork. It was such an easy project I wanted to share with you what I used and how I did it. Get a plan - Dig around your house and find some artwork. (It may even be stored in a box at the moment). The goal here is to use something you already have on hand. Then, find a wall in your home where you're looking to add some impact with artwork. Hang the artwork on the wall as you normally would with a simple nail or picture hook. (The chain is just going to be used to get the look, not support the piece.) I chose to hang my prints lower than usual, to fill up more wall space and allow your eye to notice the chain detail. As you can see from this picture, the bottom of the artwork is almost even with the bottom of the light switch to the right. Obviously, you will need to take into consideration the size of your artwork and ceiling heights to get the right placement. 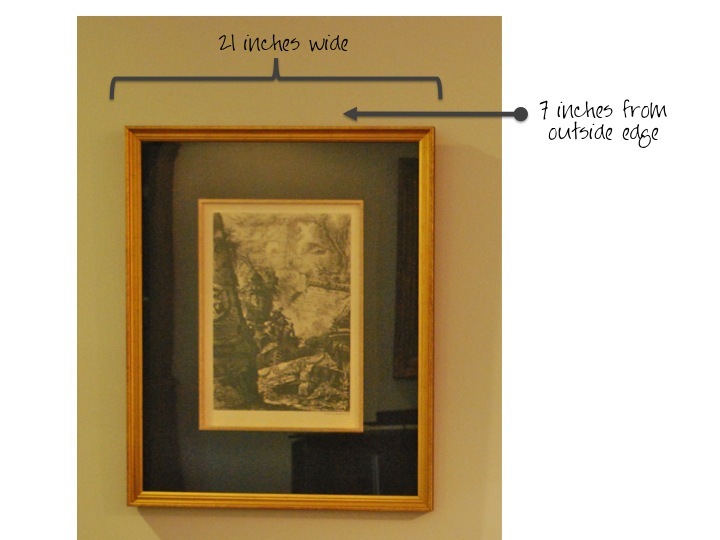 Measure the width of your artwork and divide this number by three to get the proper placement of the chain. As I tell my son, "wake up those brain cells!!!" For example, my piece was 21 inches wide. So, 21 divided by 3 is 7 inches. So, the chain should hang 7 inches from the outside edge on each piece. BTW, it is very important to measure this (don't eye ball it)! Your eye will be drawn to the chain, and if it isn't even, it will not look right. Using a yard stick and a level, mark the points on the ceiling where the cup hooks will go based on the calculations above (this will hold the chain), and screw the hooks in place. I have crown molding which required I place the hooks just below it. If you don't have molding near your ceiling, you can either place the hooks just near the ceiling or it would look great if you placed the hooks directly into the ceiling nearest the wall. Select a flat chain for this project so that the picture will lie flat to the wall. I used Brass Sash Chain, but you could also use this or even this if you liked the look better. Also, I used brass for my project because I had a gold frame. I think it looks best to coordinate the color of the chain with the frame color. Place your chain on the hook and then cut it (with wire cutters) 3 inches longer than the top of the picture. You want to have a bit of chain to tuck behind the picture. And that's it!!! You now have a picture with impact. One last word of caution. This project is so easy and inexpensive that it's tempting to do it in every room. Don't!!! These types of touches really loose their impact when you use it multiple times in your house. So refrain! I would love to hear from you, if you do this project in your home! Have a good one. M.
We have actual picture molding in our Victorian - any ideas for working with that? I know people used to use ribbon and rosettes, but that's a little fussy, no? You are amazing. What a great how too and even better, they look AMAZING!!!!!!! I just might do this!! I love this look! Awesome tutorial on a super cool project. I love the look more every time I see it now! Great idea & how to! Where did you get your chain? Under step 5 in the post, there are links to get the chain, just click on the word "Brass Sash Chain." I hope you take on this project! Would love to see your results. M.